With the advent of Self or Indie Publishing authors have the ability to bundle their books or release them as they want. This freedom also allows authors to partner on anthologies and box sets in ways the big six or five( I never can keep track of who is left) publishers would have never dreamed doing. And this allows readers to get to know authors they may not have tried or taken a chance on before. The box sets and anthologies are usually priced reasonably so the reader feels they are getting a deal and if they don't care for a book or an author in the bundle it is still worth the price of the other stories or books. I've been fortunate lately to have been asked to be in two anthologies and a box set. All three ventures had different things I had to consider and hurdles I had to overcome before I first agreed and then worked with the others to put the projects together. 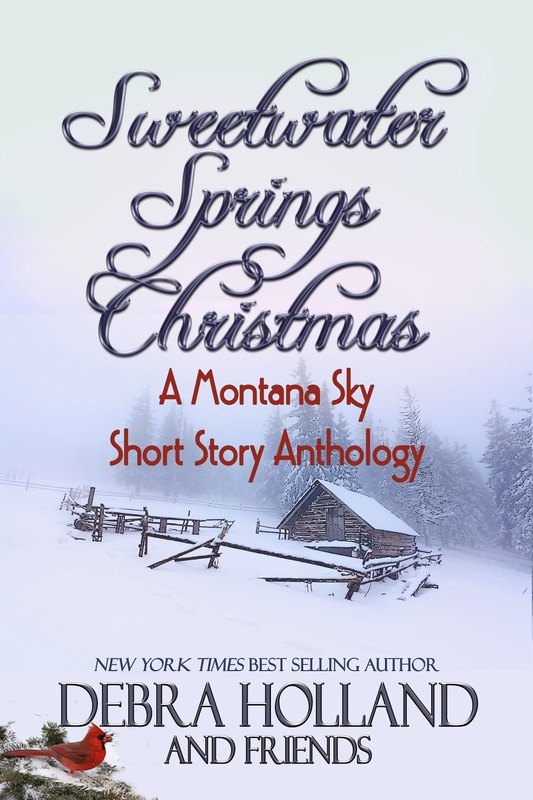 The first anthology was Sweetwater Springs Christmas: A Montana Sky Short Story Anthology. The stories for this anthology had to be written in Debra Holland's fictional historic western town of Sweetwater Springs, Montana. In order to write those stories we had to know her town and her characters to add them to our stories. I had two characters from my Halsey Brothers Series as secondary characters. This book proved to be daunting with trying to keep all the logistics accurate. There were thirteen Christmas stories all happening in the same town in the same year. The second anthology will be out March 15th. 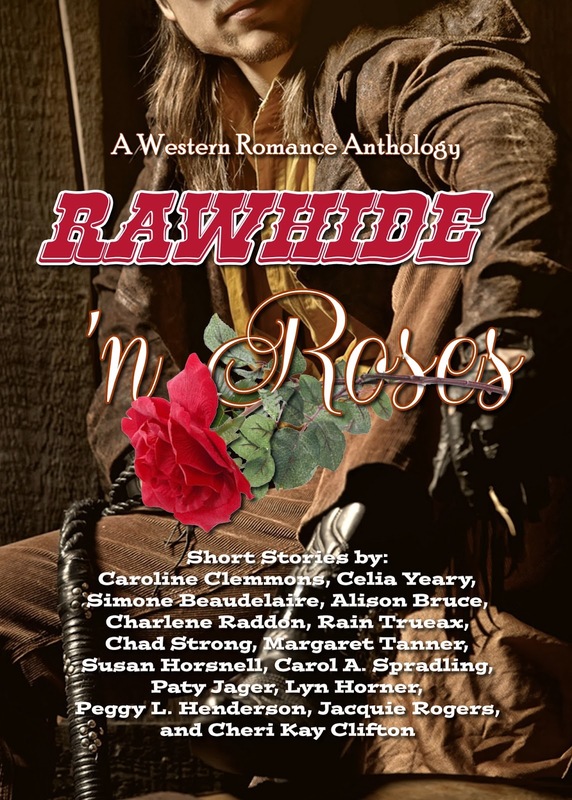 This anthology, Rawhide 'N Roses, came about when the authors on a western author kindle forum started talking about finding ways to get more readers to find us. The reader who started the forum and moderates it was all for us making an anthology. So there are fifteen authors who each wrote a story like their western romance novels and put them together in one place so readers of western romance can read our work and go find more from each of us. It was a team effort to come up with the title, cover, and length of stories. Then different authors each took on a task to make the book a reality and to help promote the book. Last fall, I was asked to be in a box set. 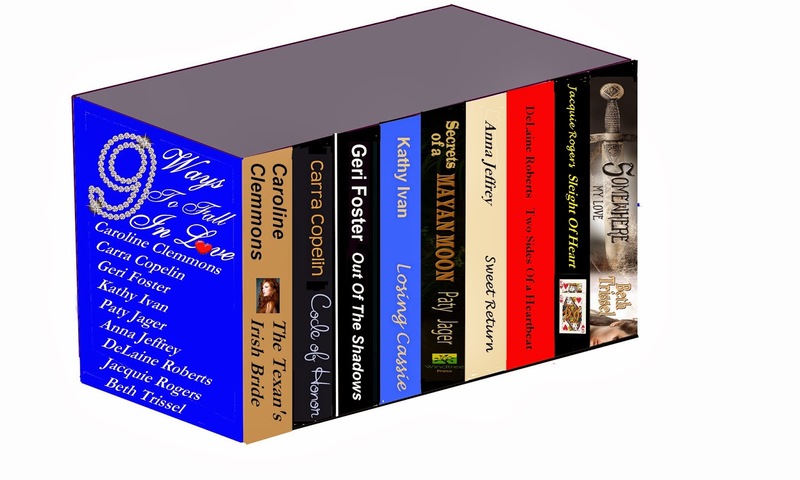 I put Secrets of a Mayan Moon in the box set 9 Ways to Fall in Love. The set was a success. We had a huge release party on Facebook and the box set ended up getting me a large number for reviews for Secrets of a Mayan Moon. 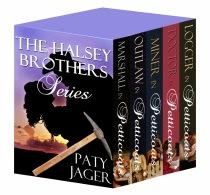 In November I put together a box set of the Halsey Brother Series. The set of five books was on sale for $.99 for a month then I upped the price to $8.99 and it's still selling well. I believe readers like purchasing the box sets because they get a better deal per book and they know they have the complete series and don't have to wait for the next book to come out. If you've purchased an anthology or box set why did you buy it? And were you satisfied with the read? I have purchased both anthologies and box sets. I buy anthologies to try out new authors at a reasonable price. I buy box sets of books mainly as gifts when I want to share a wonderful series with someone for a birthday or holiday gift. Thank you for sharing your different experiences. Very interesting. Great post Paty, Can't wait for Rawhide 'N Roses to be released. Hi Sarah, Thank you for purchasing everything! The whole business of both the anthologies and the box sets has been an eye opener and interesting to be a part of. Hi Margaret, Yes! I'm getting excited for the anthology to hit the venues and see how readers like it. Thanks for stopping in. Paty, I really like the box set and anthologies for two of the reasons you mentioned--they are a great deal and I have the chance to read stories by authors I might not have heard of, as well as read stories by authors I already enjoy. Glad this has been a positive experience overall for you! As a reader, buying an anthology with at least one author I like has helped me expand my author list! While I've bought a couple of boxed sets, I've not read any of the books because I've not taken the time to sit down and do it. More likely to grab a book to read for a few minutes than to grab my e-reader...and the boxed sets are on the e-reader. I am curious as I'm recently published in an Anthology and considering participating in another one, about the experience as an author. Thanks for shedding some light on how it works when multiple (15!) authors are involved.